In family dentistry, details matter. 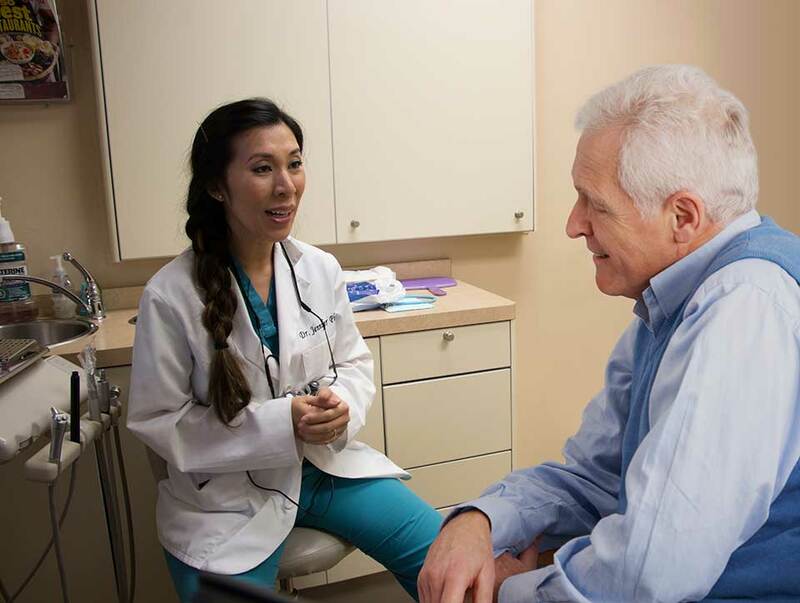 You’ll notice the little extras at our practice, from convenient family appointments, to our comfortable office and exam areas, to gentle cleanings and procedures. We put the well-being of our patients above all else, and utilize advanced dental technologies, including the Wand® anesthetic delivery system, soft tissue lasers for advanced gum care, and digital x-rays to make dental care safe, efficient, and comfortable. We focus our care on a foundation of healthy teeth and gums by encouraging patients to establish a practice of routine care at home in addition to regular office visits. By building a relationship with each patient, we are able to tailor our services to individual needs and preferences. Our gentle, compassionate care is appreciated by seasoned tooth pros, nervous adults as well as children who are just establishing oral care. It’s easier to prevent oral health problems than to fix them. To keep your teeth and gums healthy, we recommend scheduling a preventive general dentistry appointment every six months. Regular cleanings and check-up s that are performed by a dental professional. These cleanings help keep tartar and plaque from building up on the surfaces of the teeth, and provide an opportunity to recognize potential issues early. Fluoride has been shown to help strengthen teeth, making them more resistant to decay. At Greenhill our general dentistry includes tooth-saving fluoride treatments and fluoride varnish that lasts up to six months. We apply sealants to the teeth to protect them from decay. Sealants are plastic coatings that are placed on the teeth to create a barrier that prevents decay-causing substances from collecting on them. X-rays are valuable for diagnosing potential problems in the teeth, gums, and bones which are often not visible to the naked eye. Digital x-rays reduce exposure to radiation by 90 percent while producing a high-quality image immediately, eliminating the need to wait for traditional x-rays to develop. In some cases, a tooth becomes so badly damaged or decayed that the pulp of the tooth becomes infected. To save the tooth, we perform endodontic therapy, commonly known as root canal therapy, the to remove the infected pulp, before filling the tooth, and sealing it with a porcelain crown for added strength. We do whatever we can to preserve every tooth, but sometimes removal is the best or healthiest option. To make your tooth extraction as comfortable as possible, we use the Wand®, an advanced anesthetic delivery system, to ensure your procedure will be pain-free. Once a tooth has been removed, we will recommend several tooth replacement options, including dental implants, and dentures or bridges to prevent the surrounding teeth from shifting out of place. We understand the anxiety that often accompanies a visit to the dentist. We are committed to ensuring that all of our patients are comfortable and relaxed. Oral sedation allows us to make this happen and to fix, in one visit, years of ignored dental problems. Best of all, we offer sedation options with no additional in-office costs. Dental implants provide a foundation for replacement teeth that function like natural teeth. Patients can eat, drink and talk with confidence, knowing that implants appear natural and preserve facial contours. Implants follow a process, from extraction, to surgical placement of the posts to attaching replacement teeth. Greenhill is pleased to offer this service from doctors you know and trust. Our training and experience allow us to offer this service in-office rather than send patients elsewhere. In fact, many other practices refer their implant patients to us! We are proud to offer Invisalign clear braces for a comfortable, convenient, and nearly invisible way to straighten teeth. Our staff is highly experienced in treating patients with the Invisalign system instead of referring them to an orthodontist. Invisalign is available to teens and adults, and can even help correct teeth that have shifted after previous orthodontists. Before embarking on any major dental work Greenhill offers a free consultation appointment to map out a plan specific to you, explain the procedures and costs, and answer your questions. We offer the same care and consideration for established patients as we do for new patients or those seeking a second opinion.